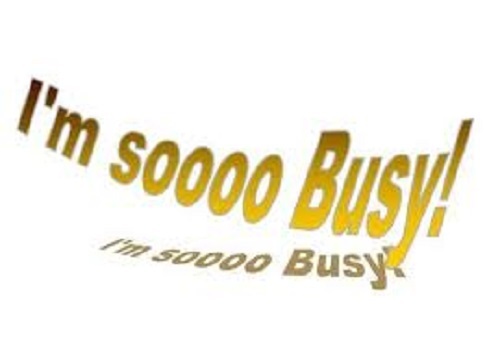 I’m just t-o-o-o-o busy. Really? OK, maybe it’s just me but why does it seem that the least busy people are never really that busy. The inference is, of course, that somehow I do-have more time that is. I think somehow she felt that saying she was so-o-o-o- busy meant she was more valuable or something as it was said with an air of superiority. Exc-u-u-u-u-se me—I have the time because I make the time. Why is it we all have to be busier than the next person? Why do we marry our worth with our busyness? The truth is, society seems to give kudos to those whose lives are frantically busy. Shouldn’t it be that we sympathize with those who are “too busy” rather than elevate them? What’s so praiseworthy anyway? The person I mentioned at the beginning of this post? She doesn’t work outside the home. Her child is grown and lives away. Gets up very, very late. Doesn’t do yard work. Husband does most of that. House is very small. So she’s too busy-why? Contrast that with a young woman I know with two small children (one with special needs), a full-time job, outside interests and from whom I’ve never heard the words, “I’m too busy”. She’s never sounds stressed. I know she gets very tired but she never complains. She’s too busy living her life and feeling blessed to have what she has. Within reason, we all have the right to live our lives however we choose. But why do we have to put up a front? Why can’t we just say, “I have no outside interests, nor do I choose to.” I respect that kind of honesty. Contrast that with someone I asked the same basic question. The answer, “I don’t want to do anything.” OK, then. That person I can respect. I appreciate honesty above most other virtues. I think my new mantra will be, “I’m as busy as I choose to be.” Because that is the truth. Let’s quit puffing ourselves up. 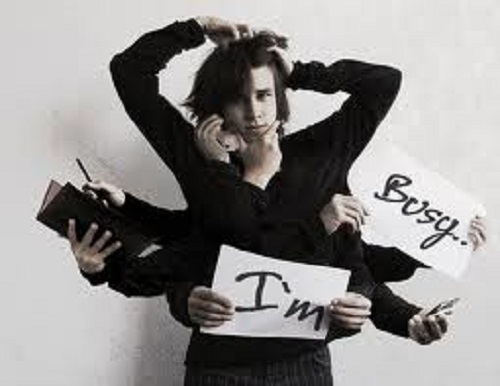 If we really are that busy, we have worse problems than our need to impress others.